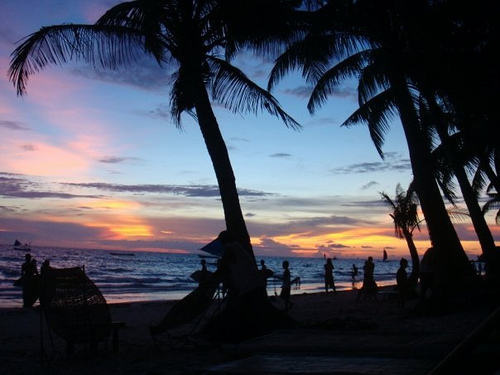 Geographically speaking, Boracay is part of the municipality of Malay in the province of Aklan, which is located in Panay, one of a cluster of islands that constitute the central section of the Philippine archipelago. Once on the island, you will find out that getting around is simple and easy. There are three categories of transport: pedicabs and motorized tricycles shared with other passengers; individually rented bicycles and motorbikes; and the shuttle service offered by some hotels. Taxis are not available. However, since everything is more or less within walking distance, you will most likely join the majority of visitors in moving around the island on foot. 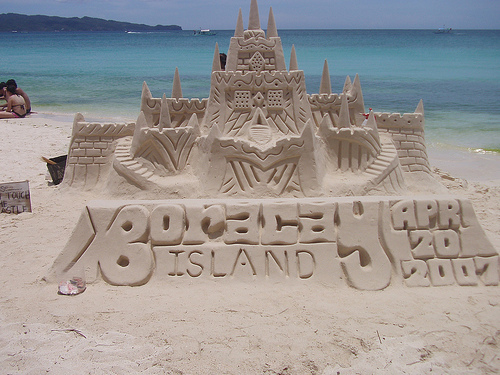 Boracay is seven kilometers long and divided into three barangays, or communities. Yapak lies in the north, Balabag in the center and Manoc-Manoc in the south. Within these barangays are smaller villages such as Angol, Manggayad and Bolabog. Yapak is spread out over hilly terrain situated some distance away from the main tourist beat, but the shoreline is dotted with beautiful, uncrowded beaches and coves such as Puka Beach and Balinghai Beach . The island's only golf club, the 18-hole par-72 course at Fairways & Bluewater , is also located in Yapak. The Bat Caves , a popular destination for nature lovers, can be found at the barangay's northeastern tip. 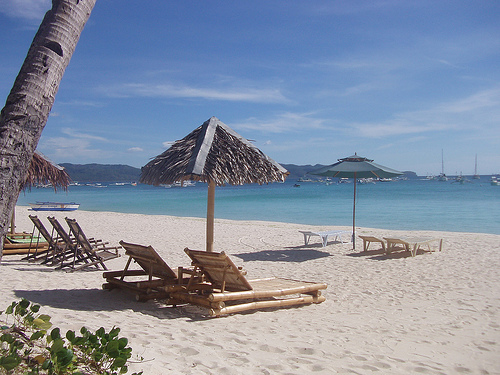 White Beach , Boracay's biggest tourist attraction, stretches some four kilometers on the western side of the island, mostly within the barangay of Balabag. It is largely because of the pristine, white powdery sand of White Beach and the crystal-clear blue water of the surrounding sea that Boracay is often called "the world's most beautiful tropical island." 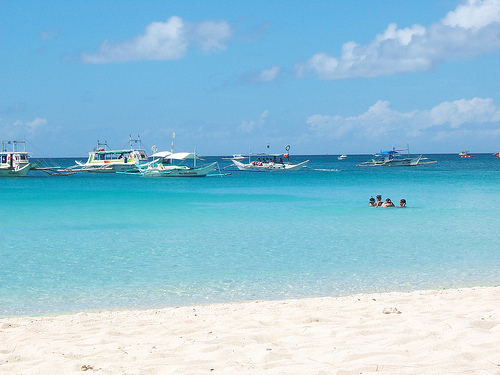 While White Beach takes up most of the western shoreline, Bolabog Beach dominates the eastern coast. Bolabog (sometimes spelled "Bulabog" or "Bulabug") belongs to the barangay of Balabag (with very little difference in spelling, Bolabog is often confused with Balabag by newcomers to the island). Normally the boat trip from Caticlan terminates at White Beach, but during the monsoon season when the western side of the island is lashed by strong winds, visitors are brought to a docking area in Bolabog. The waters here are also considered to offer ideal conditions for windsurfing. A small dirt road takes you from Bolabog to the foot of Mount Luho , the highest point on the island. Understandably hotels on White Beach attract the most guests. The northern end of the beach is "lorded over" by Fridays , the southern end by Lorenzo South . In between you will find all kinds of accommodation, from native bamboo-and-nipa bungalows to Western-style concrete buildings. White Beach extends into Manoc-Manoc, but the barangay features its own share of beaches worth visiting and exploring, including one named Manoc-Manoc Beach . The barangay also encompasses the Boracay Beach & Yacht Club and Crocodile Island, a popular destination for picnics, diving expeditions and marine excursions. The Dead Forest , a scenic spot believed to be populated by elemental spirits, is likewise located within the boundaries of Manoc-Manoc. White Beach Path runs along White Beach but is set back from the shore by rows of coconut trees. Hotels, eateries, bars, stores and dive shops line the entire length of the meandering footpath. This is where visitors to the island come to see and be seen. You will find hotels like the longstanding Red Coconut Resort and more recently constructed Boracay Regency Beach Resort on White Beach Path, and likewise the Tourist Center , a handy one-stop shop for all kinds of travel needs (airline reservations, postcards, stamps, film, souvenirs and so forth). Thai Castles, True Food, Steakhouse Boracay , Gorio's , La Reserve Restaurant , Banza and La Capannina are among the better known eateries. Bars include Bom Bom and Summer Place Bar & Restaurant . Victory Divers and Aquarius Diving are just two of the many dive shops (there are more than 20 such outlets on the island) scattered along the path. Retail stores range from Paulo Collection Body Wear to Lonely Planet. The Talipapa Market, which burnt down in early 2005, has now been rebuilt in several locations between White Beach Path and Boracay Main Road . Tricycles ply Boracay Main Road and a handful of side streets but are not allowed on White Beach Path. Except for Jony's Beach Resort , the town square (where the church and DOT Office are located), Beachcomber Bar & Disco , Moondog Shooter Bar , Pink Patio Resort and a few other establishments, there are not many places geared toward tourists on the main road. You may, however, ride a tricycle on the road to get to a hotel or an eatery on White Beach Path; just get off at the nearest stop and walk the rest of the way. To facilitate locating an establishment on the island, the nearest boat station is often specified in its address. Here a word on these stations is in order: Numbered 1, 2 and 3, they are used as stopping-off points by boats ferrying new arrivals from Caticlan. Do not, however, expect some well-constructed structure with a welcoming jetty for you to conveniently step on. To disembark, you can go for one of two options: Jump into the water and wade ashore or allow yourself the luxury of being borne aloft on the shoulders of some hapless porter. Happy landing!